Your little Appartment is situated in a big House with 5 appartments. You are on the first floor and you will share the entrance with 3 other appartments. There is a small kitchen and livingroom with a double sofa bed. for 1 adult or 2 children. There is a small bedroom with 2 beds and a big bathroom with bath and shower. The little balcony has a view on the street and the entrance of the beach. 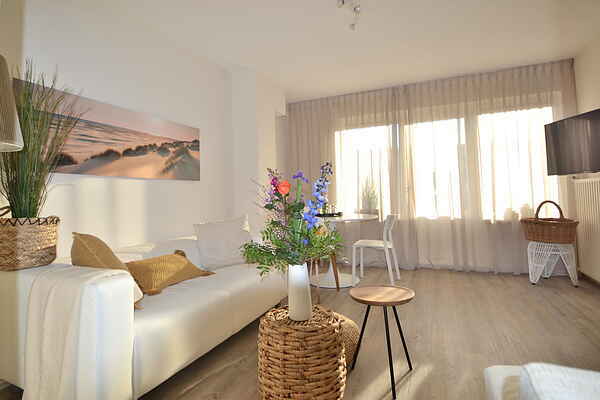 The house is situated just a 100 yards from the beach, the centre of town, the boulevard and the lighthouse of Noordwijk. Beautiful hiking and biking trails pass near the house and take you into the dunes and along bulbous flower-fields reaching over to the Keukenhof. Cities like Delft, Leiden, Amsterdam and The Hague are also very close! Details: the House is completely renovated in early 2019. You will receive a ticket for the parking.